THE GOHONZON is a graphic expression of the Mystic Law, Nam Myoho Renge Kyo. It is inscribed on a scroll of paper which is hung in an altar called The Budsudan. As we chant Nam Myoho Renge Kyo, we focus on The Gohonzon in order to activate & shine within us The Treasure Tower. Subsequently, the ultimate power of this Law helps us to awaken our innate Buddhahood. That is when we advance towards attaining Wisdom, Courage, Compassion and a high life-state of The Buddha. Chanting in front of this “object of devotion” is not referred to as idol worship. Infact, it is considered to be a “mirror” of our own lives. This mirror actually reflects our innate enlightened nature and the true aspect of our lives. Most importantly, we should be aware not to expect this scroll of paper to be a wish-fulfilment idol or magic wand, to fulfil our wishes! A mirror does not make us look pretty or apply make up for us. It is we who make the efforts to dress up or apply make-up. The mirror simply reflects our efforts! Similarly, when we chant to The Gohonzon, we don’t expect the scroll of paper to fulfil our wishes. Instead, it is the power of the chanting that we do which helps us reveal our Buddha nature. Since we chant with unshakable Faith in The Gohonzon within us, we are eventually able to bring forth the Wisdom to help ourselves and others. That is how we succeed in creating happiness for self and others. In the words of Nichiren Daishonin, “Never seek The Gohonzon outside yourself”. So The Gohonzon is not this outwardly object of devotion that we chant in front of. Instead, it is a Treasure tower within us. Moreover, we shine this Tower through our daily practice of reciting The Lotus Sutra and chanting Daimoku (Nam Myoho Renge Kyo). 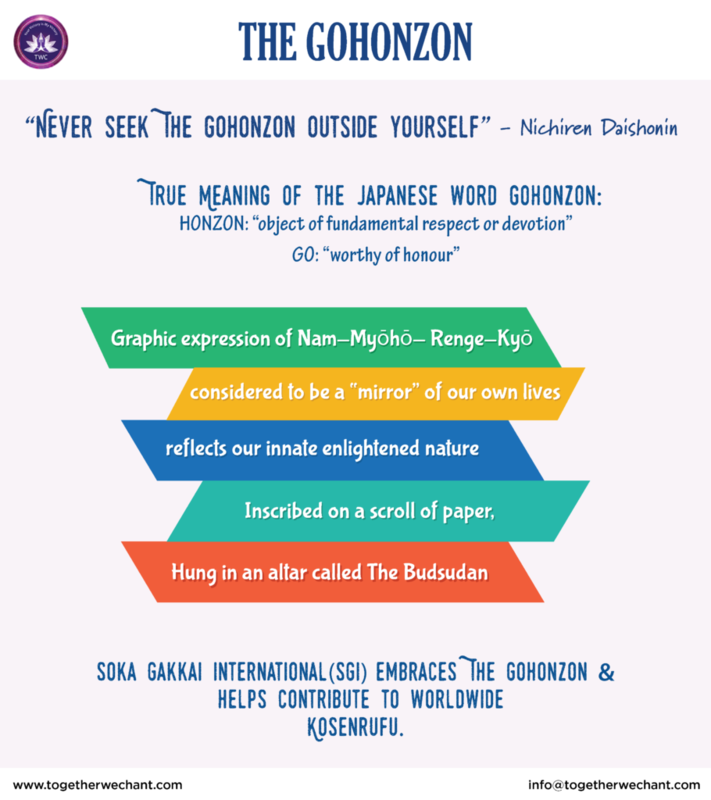 SGI, with the excellent leadership & guidance of its three founding presidents, has embraced The Gohonzon and helped contribute to worldwide Kosenrufu. Through the efforts of their members who chant Nam Myoho Renge Kyo and participate in SGI activities to promote the Law, SGI has helped achieve peace, happiness, good fortune and victory throughout the world. Let us continue to polish & shine The Gohonzon within us as we chant abundant Nam Myoho Renge Kyo, and participate in Kosenrufu activities worldwide. This article is inspired by articles available online but is not a replica of the same. It is based on my understanding of the concepts through my own experience of chanting this wonderful Mystic Law.